Independent Bookstore Day is May 2nd and our state's lovely Independent Bookstores want to put books in your hands and connect you to a whole new world! Celebrate with these local peddlers of paperbacks with specials including sale prices, contests, and even some cake! Besides being Independent Bookstore Day, May 2nd is also Free Comic Book Day and a number of bookstore and comic book stores are hooking it up for the graphic novel fans. Click here! Thrifty Joe's Books and Music Glendale: 602-547-2540. 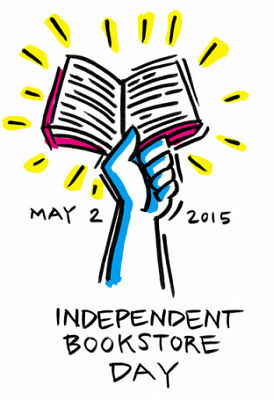 In celebration of Independent Bookstore Day, Thrifty Joe's is running a raffle April 25 - May 2! Enter to win one of four $25 gift certificates, or the iconic Thrifty Joe's hutch! One entry per day for either the gift cards or the hutch. Ask about the raffle in-person at their front counter. No purchase necessary. Visit their website here! Changing Hands Bookstore Tempe: 480-730-0205. Phoenix: 602-274-0067. Only on Independent Bookstore Day enjoy 15% off almost everything at our Tempe and Phoenix stores, and happy hour prices all day long at First Draft Book Bar! Changing Hands will also have 14 extremely limited edition items, with no pre-orders or holds on these items, so you'll have to join in order to get your hands on these exclusive gems. Visit their website here! Antigone Books Tucson: 520-792-3715 Join Tucson's 100% solar powered bookstore for all day amusement including all-day entering to win a $25 gift certificate, one-of-a-kind books, art pieces and gifts created especially for Independent Bookstore Day, and a free Antigone bumper stickers for everything while supplies last. Also, got a Smart Phone? Take your photo with an Antigone “speech bubble,” tag us on Facebook or Twitter, and you get a coupon for 20% off the item of your choice on May 2nd. Visit their website here! Bonny Books San Tan Valley, Queen Creek, and Mesa: 480-388-5514 Follow Bonny Books on their Facebook to keep up with their Independent Bookstore Day specials! This includes contests, deals, and fun. Their Facebook is here! Visit the following local businesses for a free comic book. Call or visit their websites for guidelines and regulations about the great opportunity of free graphic novel(s). Bookman's Flagstaff From 9am to 10pm. 1520 S Riordan Ranch Flagstaff, AZ 86001 (928) 774-0005 Click here for their website. All About Books & Comics From 10am to 6pm. 5060 N. Central Ave Phoenix, AZ 85012 (602) 277-0757 Click here for their website. The Peregrine From 10am to 4pm. 219A North Cortez Prescott, Arizona 86302 (928) 445-9000 Click here for their website. Thank you for Arizona Give Day!